If you have decided to build a raised wood deck, your deck will need a railing. The correct method of mounting the railing posts, so that they are safe and secure seems to cause a lot of difficulty for many home handymen. At the time of writing this article the most common building codes in the US requires a railing on a deck that is higher than 30 inches from the ground. In Canada a railing is required for decks that are higher than 24 inches from the ground. 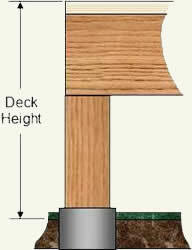 Note: The height of the deck is the distance from the top of the ground to the top of the deck floor material, as shown in Figure 1. Note: The height of the railing is relative to the height of the deck from ground level. Decks that are between 30 inches (24 inches in Canada) and 70 inches require a railing that is 36 inches high, decks that are higher than 70 inches require a railing that is 42 inches in height. The railing height is measured from the top of the deck flooring to the top of the railing. Note: Always check your local municipal building codes to make sure that your railing height meets their requirements and by-laws. There are 3 methods to mount a deck post to your raised wood deck. Mounting the deck posts on the exterior of the deck, to the rim joist or floor joists, as shown in Figure 2, is easier than mounting the deck posts to the inside of the rim and floor joists. 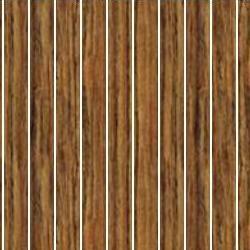 This is primarily because you do not have to notch the flooring material around the deck posts. Cut your deck post to height. 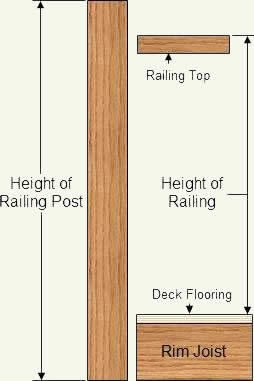 The height is determined by the required height of the railing, plus the height of the rim joist, plus the thickness of the flooring, plus the height above the railing if you are planning to have the posts above the railing height, as shown in Figure 3.